This past summer I asked my my youngest daughter why she never used her computer and was always using mine. Her response – “because I don’t have a computer desk”. Well, now she does. She wanted a desk with subtle Asian influence. 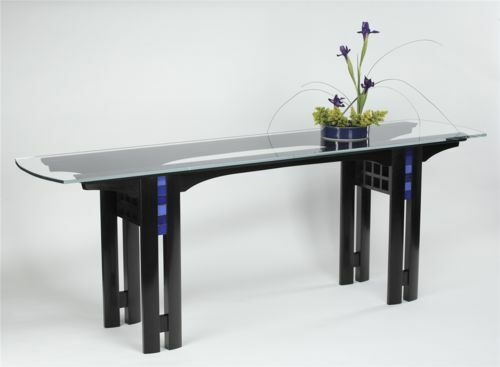 In between dozens of pictures I showed her a hallway table that Kevin Rodel made that also had elements from Charles Rennie Mackintosh. She loved the look. From there it was on to SketchUp to put the details into something I could work from. As a side note, I’m not sure how I built projects before learning SketchUp. It makes the build process so much faster and changes are considerably easier to incorporate in SketchUp rather than having to work out all of the details and dimensions in the shop. From there, I wrote a blog about the build. There were some really large router bits and tricky router work required to achieve the edge profiles on the legs and the top edge. She designed a lillly pattern for the stained glass panels on the legs that we took to Glass Heritage and my good friend Alex took care of the panels for us. 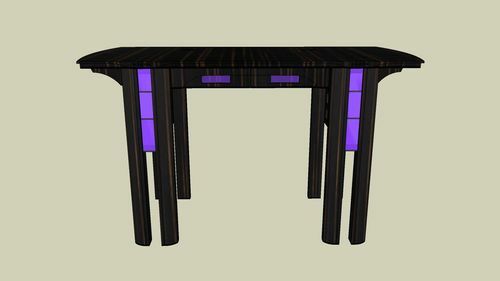 Final details: The desk is 54×28, ebonized walnut, finished with Arm-R-Seal. I came home from work this afternoon and she was working at my computer so I asked her why she isn’t using her desk and computer. Guess what her response was? “I need a chair”........... Guess what I’m working on next? Her sister’s bed…....then her chair. Simply beautiful. Anew family heirloom. 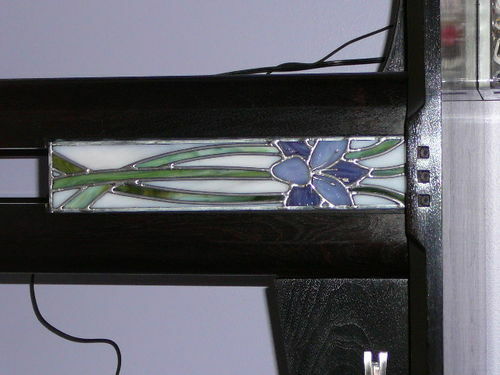 earl that is just gorgeous.i love your design and the leaded glass is a real nice touch.your daughter has got to be thrilled with it.good luck with the chair,ill be looking forward to it. Very nice. I like the design and the finished look. 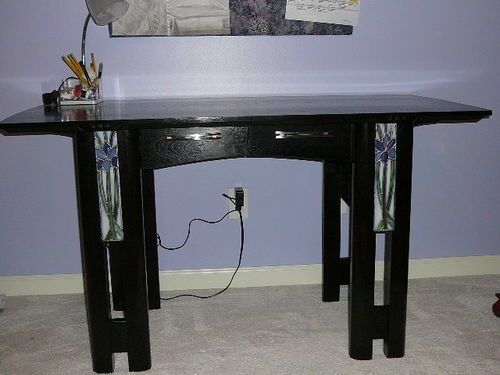 This is a beautiful desk and it’s so nicely done. Great to see the final product! Super nice job, man! You should have some professional shots made of the ensemble when you’re done with her chair.